If you have been following this blog, you know that my daughter loves nature. Over the past year, she developed an intense interest in lemurs. She has learned a lot about their behaviors, their diet, their primary predator (foosa), and their ancestry. 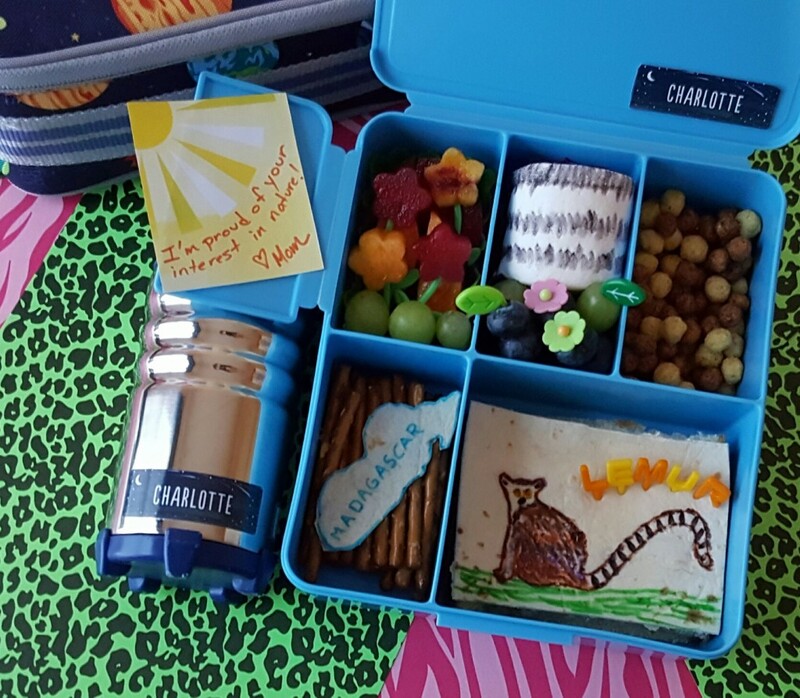 Traveling to Madagascar to see lemurs in their natural habitat is on her wish list. Fortunately, we have made three visits to science centers where she has been able to watch ring-tailed lemurs and to see foosa. 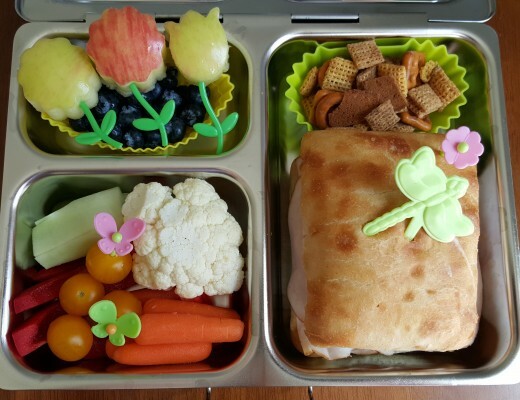 Her desire to learn more about these interesting animals and their habitats inspired this lunch. 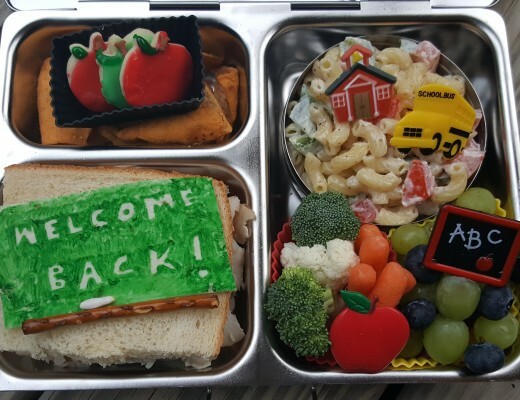 The lunch was packed in a Spencer Bento Box from Pottery Barn Kids. In the top left section, I included several types of fruit because lemurs obtain much of their nutrition from fruits. Here, I included slices of pluot and nectarine as well as grapes and blueberries. I cut some small pieces of fruit in the shape of flowers and placed them on stem picks. In the middle section, I included a very large marshmallow which I colored with food safe marker to mimic the dark and light stripes of a ring-tailed lemur. I filled the third section on the top row with Envriokidz Leapin’ Lemurs Cereal. My daughter was so excited to find this cereal at Whole Foods! She never expected to see this relatively unfamiliar animal featured in this fun way. 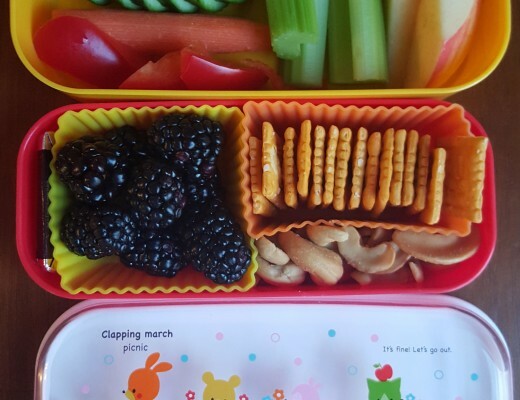 In the bottom left section, I included pretzel sticks because they resemble tree branches. Lemurs are very good at climbing trees and leaping from one branch to the next. On top of the pretzels, I places a piece of tortilla cut in the shape of Madagascar, the only place on earth lemurs exist in a natural habitat. In the main section, I included a peanut butter sandwich. Above the sandwich, I placed a piece of tortilla on which I drew a lemur with food safe markers. I used letter picks to spell out Lemur. 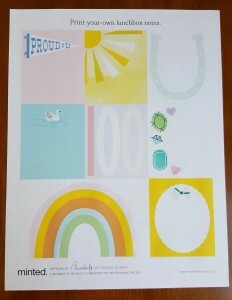 I included a free printable lunchbox note from Minted. They have several available and I selected the one above with the sun because sun basking is a common behavior of lemurs and something that my daughter likes to observe when watching them. I labeled my daughter’s water bottle and the lunch box with custom labels from Minted. 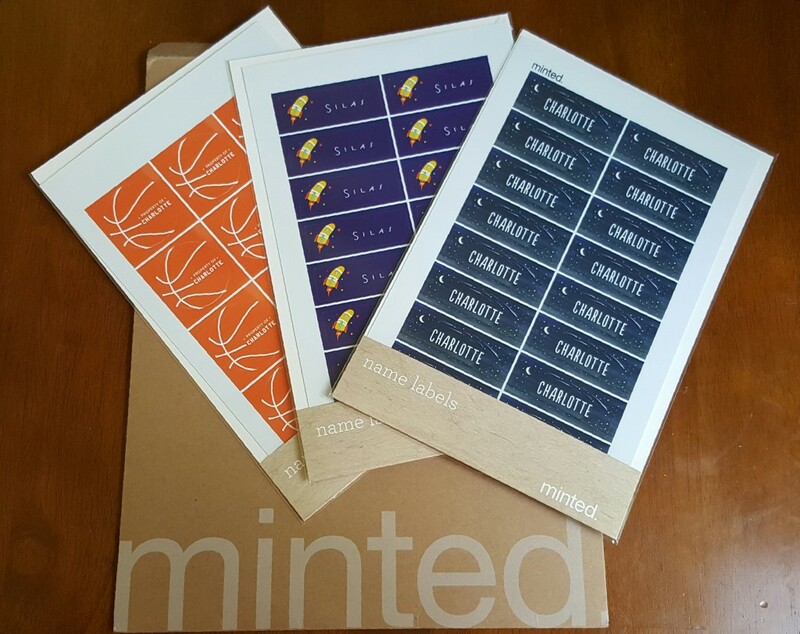 Minted has an easy to use, web-based program that allows you to choose a theme, add text, adjust the font, etc. so you can deign labels that match your child’s style and interests. These labels are made to last and work well for marking items that will be used at school or in other public places.